At the request of the Mayor of Kendal, Coun. 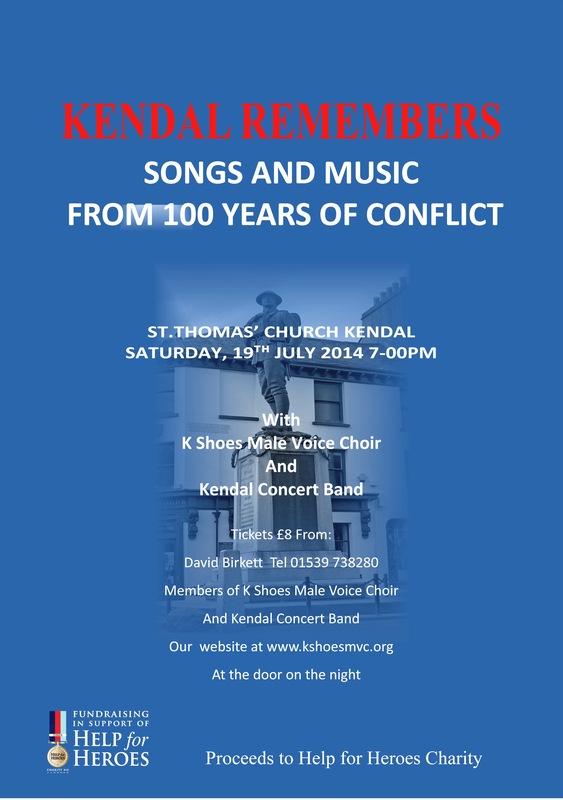 Tom Clare, K Shoes Male Voice Choir and Kendal Concert Band joined forces to present the music of four wars in aid of Help for Heroes. A full house at St Thomas’s Church heard songs from both World Wars and enthusiastically sang choruses led by the excellent tenor, Ederic Ibbotson, who, with his accompanist, Andy Glanville, moved the audience to tears as memories flooded back. This was a night where sentiment unashamedly reigned. K Shoes impressed with two a capella arrangements, When This Lousy War Is Over and Hanging On The Old Barbed Wire, while there were few dry eyes when the Last Post and Reveille were sounded by Kendal Sea Cadets. The second half was uplifting and the band delighted the audience with the rip-roaring Dambusters March and a superb rendition of a medley of Benny Goodman tunes, featuring the talented solo clarinettist Peter Bayliss. The high energy of Ian Allan, the choir’s irrepressible conductor, brought out the best from all the musicians and two emotionally-charged songs, Sailing and Wherever You Are from the most recent conflicts, united both ensembles to round off a highly successful evening in style.